Optical Hardware’s Visionary binoculars have an excellent quality, bright image. The have easy grip rubber armouring and large eyepieces and eyecups for stress free viewing. The Visionary HD 8x42 is a lovely pair of binoculars, nice to hold (not too heavy, not too light) with a good rubber covered grip. Focusing is quick and accurate with the large focusing wheel. The Visionary HD 8x42 have a great image, an image that one would expect paying nearer to £100 for! The image is bright and very sharp, making it ideal for use even in fairly low light conditions. 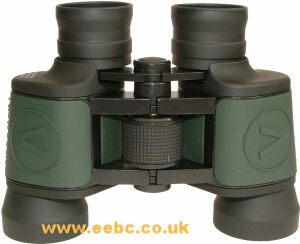 When used in normal daylight, it is ideal for nature viewing, bird watching, horse racing, as well as a good pair of binoculars for everyday general use. The large, soft rubber eyecups are very comfortable to use, even for prolonged viewing. 18/04/2007 20:39:19 Just a quick thank you - I placed my order for a pair of these yesterday afternoon via your website and they arrived first thing this morning. Excellent service and very good binoculars - I would not expecting too much, but the image quality is excellent and the big eyecups are ideal as I wear glasses. 26/06/2007 09:40:22 I looked at several binoculars at the Messingham Sand Quarry open day, these seemed very good, I could not tell much difference between thse and my friends Opticron binoculars which were 3x the price. I have placed my order and look forward to getting them. Are you doing Whisby reserve again this year? 26/06/2007 09:48:18 The Optical Hardware binoculars are optically much better than one would expect for the price. We will dispatch them today and you should get them tomorrow morning. We have NEVER done Whisby reserve, we have never been invited to do it. We have had people in the past try and return items bought there to us! Perhaps since we are only about a mile or so from it, we seem to get associated with it!